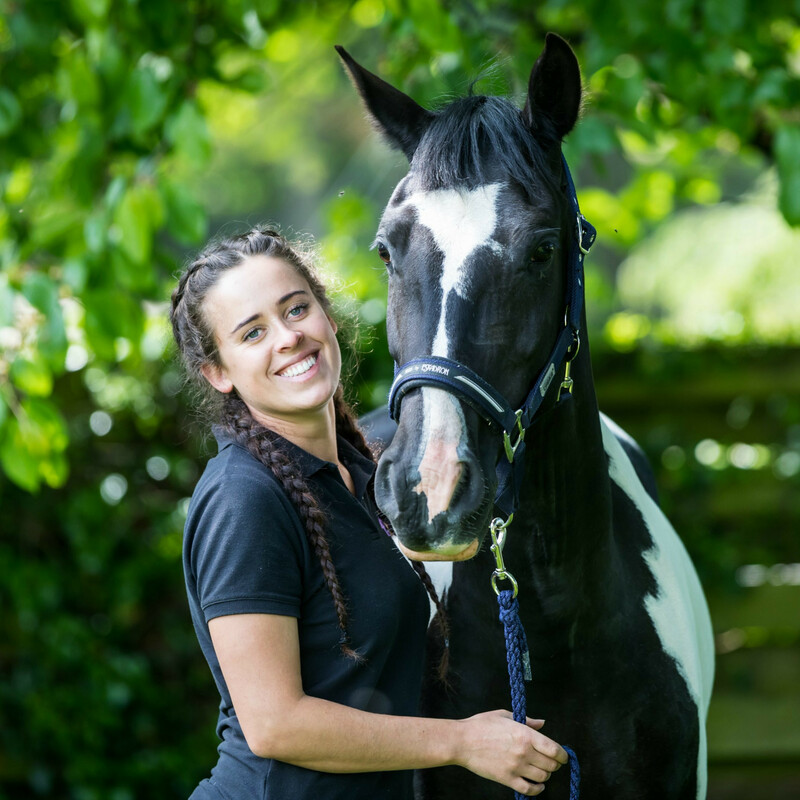 Riding Equine Vets / Blog Grid / Training aids – help or hindrance? It’s important to remember that training aids are there to aid and educate your horse rather than be used as punishment. If used incorrectly they can do more damage than good. A great way of keeping track of your horses’ progress is to take ‘before’ and ‘after’ photos, this may help you keep motivated too! 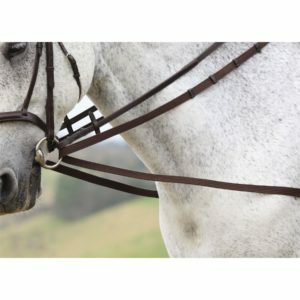 Draw reins – They are a continuous strap, 15 to 17 feet long, buckled in the centre, with ends that you fasten to the girth either between horse horses front legs or on your girth buckles. The draw reins go from the girth, up through the bit rings and back to the rider’s hands. 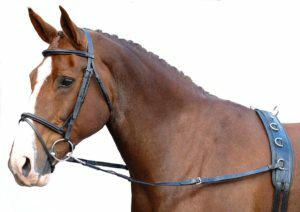 Draw reins don’t have much stopping power; use them together with the regular snaffle rein on your horse’s bridle, holding the two sets of reins as you would the reins of a double bridle (draw reins on the inside, snaffle reins on the outside). Purpose: To teach the horse to maintain a light contact whilst moving forward freely into the bridle. Side reins – You can use side reins with a saddle or a lunging surcingle. The reins loop around the girth or surcingle at one end (position them as with draw reins) and snap to the bit at the other. Buckles on each rein allow you to adjust them independently; numbered holes take the guesswork out of adjusting evenly. Purpose: Designed to encourage flexion and softness in the horse’s mouth. Once a horse does this, they will work through their backs more. 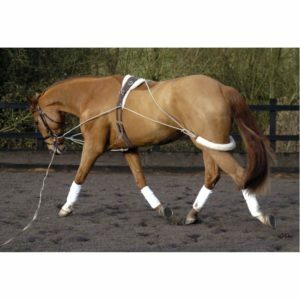 Running martingale – It attaches from the girth or breastplate to the reins. It should be adjusted so there is at least an inch of slack when the horse’s head is in a neutral position. Purpose: Designed to give the rider more control by discouraging the horse from raising its head beyond the point that the bit works incorrectly in the horse’s mouth. It has little or no influence on the horse when they are working correctly. 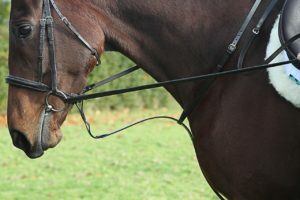 Standing martingale – The standing martingale is essentially a strap that attaches the nose band to the girth or breastplate. It should be adjusted so that when the horse’s head is in a neutral position, the strap can fit up under the horse’s throat lash. Purpose: Encourages the horse to keep their head lower by putting pressure on the nose. It prevents the horse being able to throw their head too high. Pessoa -A system of ropes and pulleys that run along the sides of the horse, with an elastic tensioner positioned behind the quarters. The tensioner is attached to the top of lunging roller. Then two lines run from the tensioner, along either side of the horse, through rings on the roller positioned half way up the horse’s body. They then continue to clip on to the bit rings via a small pulley, before being run to one of several positions on the roller. Purpose: In effect it creates a connection between the hindquarters and the bit. The tensioner and its supporting lines put gentle pressure on the quarters, encouraging the horse to step further under, and so stretch and lift the back muscles. At the same time the lines running through the bit discourage the horse from raising his head too far by exerting pressure on the mouth. As soon as the horse lowers his head the pressure is removed. Equiband System:The Equiband system consists of a saddlepad and two separate lengths of Equiband that are attached to the saddlepad. It is ergonomically shaped to prevent any restriction in the wither or lower back regions. 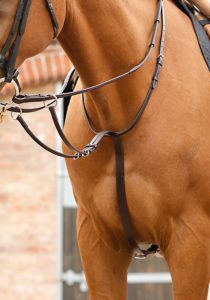 The clips that attach Equiband to the saddlepad are designed for durability and safety. The saddle pad is designed for use with jumping, dressage and western saddles. The Equiband system uses either one or both bands on the horse; one shorter band attaches the left side of the saddle pad to the right, passing under the abdomen (abdominal band or AB). The band sits well behind the rider’s leg. Its function is to stimulate the abdominal musculature during locomotion. The abdominal musculature supports the horse’s back. 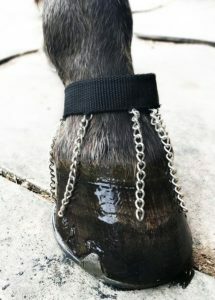 Pastern Chains: These are slightly less commonly used in the UK, but very effective. Pastern chains fasten round the horses pasterns, small chains dangle down over the horses hoof encouraging the horse to engage it’s hind legs higher once they feel the sensation of the chain. Although the term ‘Pastern chain’ sounds brutal they are not restricting in the slightest and most horses respond to them well. Purpose: Pastern Chains are another example of well researched training aids that encourages proprioception. Current research suggests that placing these over the horse’s coronet band encourages proprioceptive awareness leading to an increase in joint movement. This has been shown with placement both at the forelimbs and hind limbs. Pastern chains can be used both in ridden and/ or in hand work with aiming to increase fore or hind limb movement. • Before using horse training aids, make sure that your horse is physically able to do what you’re asking of them. Using a gadget if they have an underlying problem will only serve to make it worse. Have regular dental, physio and saddle checks to ensure your horse is pain free. • Carry out plenty of research. Thanks to the Internet, it’s easier than ever to find out how a specific training aid works and whether it will suit your horse. Consider whether it will affect the head carriage of your horse, the lateral movement of his body, or his whole frame. It’s usually best to have a trainer/instructor help, often having somebody on the floor can help you understand how your horse is avoiding your contact or aids. • Learn how to fit a training aid correctly. Often, training aids don’t come with instructions. Therefore, it’s a good idea to take what you need from books and magazines. You could also get expert advice from an experienced trainer. • Introduce horse training aids carefully. This should be done in an enclosed arena or other safe and secure setting. It’s a good idea to have someone with you in order to provide an extra pair of hands to hold your horse while fitting. Put them on the loosest setting in the first instance so that your horse can get used to wearing them. You can then adjust the setting gradually over time. As a rough guideline we recommend 20minutes twice a week. • Carefully consider which bit you will use with your chosen training aid. Generally, it’s best to stick to a snaffle, particularly if it will be combined with an aid that acts on the bit. • Know that results may not be instant. Don’t make the mistake of assuming that your horse will take to the training aids right away. Keep lessons relatively short initially in order to avoid the risk of your horse sustaining an injury, gradually increasing the length of time you use the aid. To aid with training consider readjusting your horses’ diet, if you’re increasing workload you may need to increase what you’re feeding them, depending on whether they need to lose or gain weight. If you are looking to develop your horses’ muscle or top line, why not consider a muscle building supplement to help this? We stock 2 fantastic supplements to help you but remember, your horse must be using the correct muscles first! Like us, if you don’t use it, you lose it! Please don’t use training aids as a ‘magic cure’ they must be used with guidance. Also, if you are having issues with your horse please consider other causes. There are many reasons for horses working incorrectly, such as, dental issues, gastric ulcers, lameness, back pain etc. Once you have ruled these out make a training plan, be consistent and stick at it!